‘The Greatest Jukebox on Earth’ is an online group on the social networking site Facebook, where members post videos as a way of sharing and suggesting albums, songs and artists to the ever growing number of fellow members. With a current count of some 2500+ members which keeps steadily growing with every passing day, this group is one that enhances a person’s musical taste, takes one a whirlwind musical journey and is definitely worth being a part of. It is amazing how music gets passed from one person to another. I hear of something, I pass it on to a friend, who again passes it to another and on and on. And this is exactly how this group functions... like a musical chain it keeps growing with fresh contributions by its huge base of members. It’s utterly awe inspiring to see how fast one can get access to a whole range of diverse music through this group. And therein lays the charm of this whole new concept of sharing music. 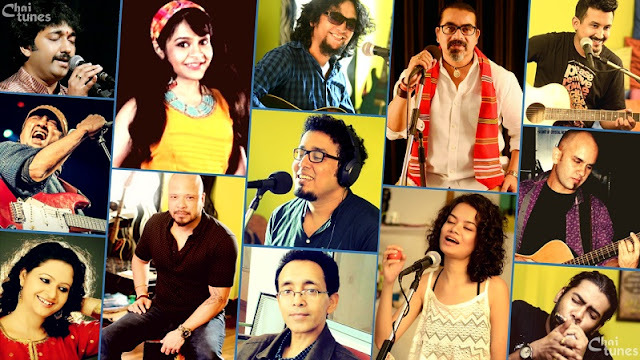 The scope to broaden one’s musical horizon is immensely facilitated by this group as one gets to hear an assorted range of tracks – from vintage classics to new age rock to indie music to lounge to classic Bollywood . 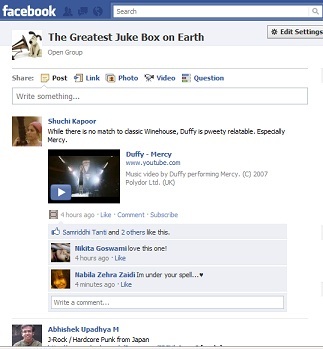 “The greatest jukebox”....the name in itself speaks volumes. It is indeed like a massive jukebox where music seems to unfold and reveal itself in all its glory. For any music lover, the creation of this group has been a blessing. Like stepping into a vintage music shop where all sorts of music await to be explored and relished, “the greatest jukebox on earth” makes rich and classy music easily available for one and all. It’s free, it’s vast and it’s a pure bliss to be able to hear so many new genres, so many unknown bands and songs. You want to join and be a part, just ask for it and someone or the other will bring you in. It’s like a crazy musical ride where the fun just doesn’t seem to stop...!